We've been giddily raving about lunchtime street vending campeónes Daddy Donkey for just under two years, and all that while we've been keenly pleased with their slow cooked/fast food Mexican menu, especially their gorgeous and creamy guac. So, when we got our grubby lil hands on Daddy D's guacamole recipe we were most definitely chuffed. No, we didn't steal the recipe; it was given to us. But we're not that special. On Monday, February 8th, Daddy Donkey owner Joel Henderson will be on the Good Food Channel's Market Kitchen demonstrating to any and all how to make his “Ultimate Guacamole”. Keep reading for the recipe. 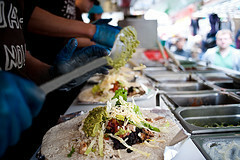 Visit www.daddydonkey.co.uk for more deets about Daddy D's guacamole, burritos and more. *The real secret to creating your own Daddy Donkey “Ultimate Guacamole” is selecting the highest quality, fresh, soft Hass avocadoes. There really is no substitute when it comes to the colour, flavour & texture of this particular variety of avocado. 1. Cut the avocadoes in half and deseed, leaving one of the seeds to one side. Placing a seed in your guacamole once finished will help to stop the avocado turning brown so quickly. 2. Scoop the avocado flesh out with a metal spoon into a mixing bowl. 3. Using a stick blender or rolling pin, crush the soft avocadoes into a sticky paste making sure to leave some tiny pieces of avocado for additional texture. 4. Stir in the red onion, pickled jalapeño chile, lime juice, fresh coriander and salt. 5. Cover and chill in the refrigerator for an hour before serving.